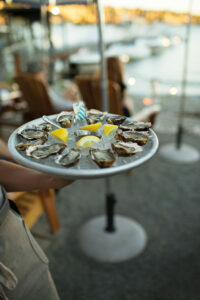 While the list of Seattle outdoor drinking and dining spots gets longer by the week, there are still only a small crop of restaurants that truly get you up close and personal with the water. Whether you fancy ferries or monster yachts, these outdoor spots will have you saying “ahoy” before the server takes your drink order. And if you’re feeling like you want to get out from under your patio umbrella and get in on the water action, we have a few places in mind. You had me at Adirondack chairs. Westward sits on the northern shores of Lake Union and provides killer views. I had the opportunity to sample my first shrub here – and I am now a fan for life. Their menu features small and large plates of the freshest fare and changes often. Make sure you check out their brunch menu which features a lovely array of original cocktails, including the “Parasol” which includes Lillet Blanc, St. Germain, honey, lemon, and sparkling wine. Palisade has been delighting diners with their view since 1992. With their waterfront view of Elliot Bay, the vistas are stunning, plus diners are treated to a shimmery display of high-end yachts docked a stone’s throw from the restaurant. If you’re lucky, you’ll see a cruise ship inch by (I did!). Every Thursday, freshly caught fish are flown in from Hawaii and Chef Eric Goodhew works his magic to create a delicious dish – the menu is a seafood lover’s dream. 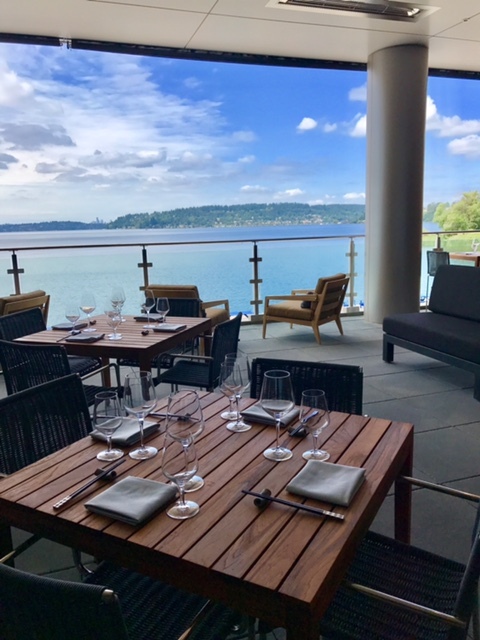 Newly opened on July 10, Water’s Table is the signature restaurant of the luxurious Hyatt Regency Lake Washington in Southport. With year-round indoor/outdoor seating, guests can indulge in the magnificent panoramic view of lake, city, and mountains. 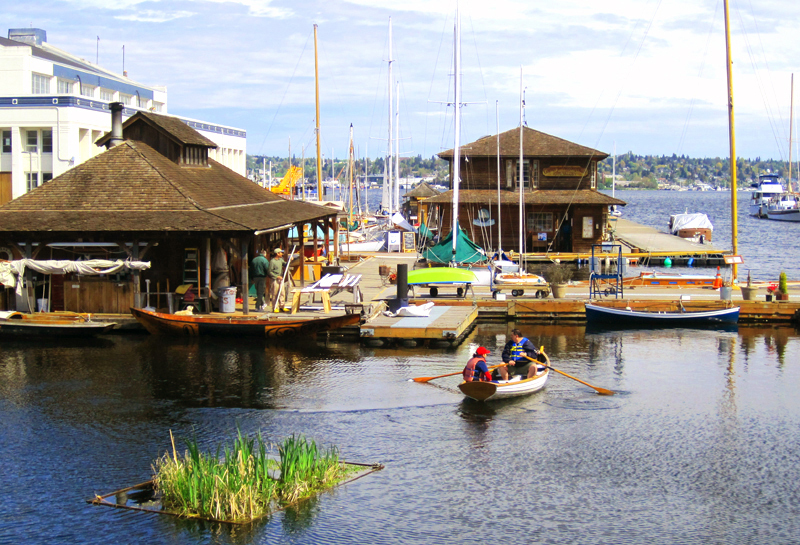 You’re bound to glimpse kayakers or boaters frolicking in the waves of Lake Washington from the restaurant terrace. From geoduck crudo to Skuna Bay salmon, the menu draws influence from Indian, Vietnamese, Thai, Chinese, Japanese cuisine and ingredients are sourced regionally. And who doesn’t want to sip a cocktail made with a spirit known as “Chinese firewater?” Water’s Table is one of the few restaurants around to offer baijiu on their bar menu. Steps away is Gene Coulon Memorial Beach Park. 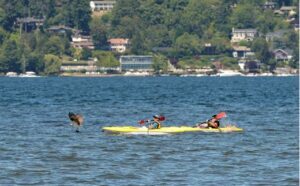 There, your day is complete when you take a small boat sailing course at the Renton Sailing Center or rowing class at the Renton Rowing Center. Perched on Alki Beach in West Seattle, Marination Ma Kai is a great spot to watch the slew of water activity, from kayaks to ferries, sailboats to speed boats, while eating your kimchi fried rice and other staple Marination deliciousness. 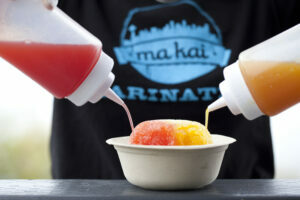 The newest of the Marination empire, Marination Ma Kai serves up their innovative Hawaiian Korean fusion to locals wanting a casual but memorable dining experience. The food is so full of flavor you’ll be telling the chefs “mahalo” after your meal. After lunch, stop by Wheel Fun Rentals and rent a tandem bike or beach cruiser. Cruise down the boardwalk and tell yourself that yes, you really do live in a place this beautiful. 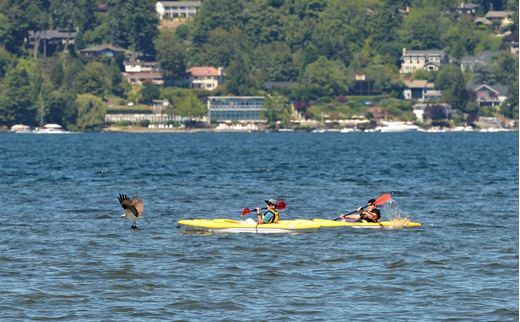 While you’re in the neighborhood, make sure you stop by Center for Wooden Boats for a delightful lake adventure in a paddle boat, kayak, canoe (or sailboat for those who pass the sailing checkout). And don’t forget the Argosy Lake Union Cruise, which features a glimpse of the Sleepless in Seattle movie home (among other great sites). 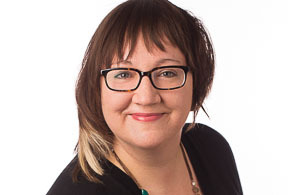 Molly Michal is a public relations maven by day and a culture fiend by night. 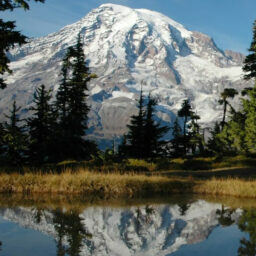 You can find her exploring the Pacific Northwest by bike, kayak, and hiking boot when she’s not at one of Seattle’s amazing independent cinemas.